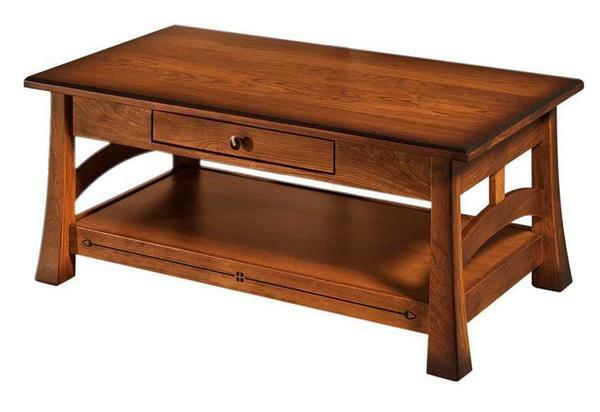 Our Amish Brady Large Coffee Table is sure to be the showstopper of your space. Handcrafted with care in Indiana by our expert Amish woodworkers, you will love its every detail that is made just for your home. Choose from 10 varieties of solid hardwood to suit your space. You are sure to find exactly what you are looking for in our wide array of handpicked options. Best of all, these materials are sourced right here in the United States, guaranteeing their quality. This made to order coffee table is built with soft-close concealed hinges, 1" thick top, as well as dovetailed maple drawer boxes. You'll enjoy premium soft close undermount drawer slides and dyed tupelo inlays at the base. Every inch of your new coffee table is made with the utmost in care, straight from the Amish heartland to your home. Bring unforgettable warmth to your space by pairing this coffee table with our Amish Brady Sofa Table. Together, these pieces of American made home furniture will create a beautiful look in your space. Create memories in the presence of furniture that is made just for you and your family. Get in touch with us by calling 866-272-6773 to speak with a friendly Amish furniture expert. Our team would love to hear from you! Just a note to follow up after the delivery of our coffee table; btw, have already filled out the review questionnaire. The table is beautiful, and just right in our mix of Craftsman, Greene & Greene and Japanese living room (sounds really weird, but those styles suit each other beautifully). We are VERY happy with it: perfect color, lots of lovely ray flake showing, solid beautiful wood with great construction. Even the delivery guys were great: they brought it in and unwrapped it for my inspection (I didn’t ask) even though they probably should have stopped at the front door. As I hoped, the table has semi-Asian lines – we really love that style. As you requested, attached are a couple of photos of the table in the living room. It’s a 31’ room facing north, so is never very bright, but hope this gives you a feel for the table’s new home. The house itself is from 1922 and fairly formal, so everything is pretty mixed up. Thanks again for all your help. I will hope to be able to purchase more DutchCrafters’ pieces in the future.